A tack cloth is a rock-bottom cheap item that helps you clean the surface prior to painting or staining, for flawless results. A beeswax-impregnated cheesecloth, tack cloth lightly pulls off sawdust, wood shavings, and all manner of debris from your surface. By using a tack cloth, you avoid applying a wet cloth to the surface. If you do not have a tack cloth, you may use a damp cloth, but make sure to squeeze it out thoroughly beforehand. Before painting, slosh your brush in whatever solvent you will be using at the end of the day to clean the brush (i.e., water for latex, mineral spirits for oil, etc.) It'll be easier to clean when you're done. Cleaning paintbrushes is hard work. And it's impossible to clean paint rollers. Some people wash them out, but I find this to be so frustrating and messy, that I just through them out. Freezer Method: Wrap the brush or roller in a plastic bag and put in the freezer. This should preserve the brush or roller indefinitely. Wrap-Only Method: If you don't the idea of putting brushes in a food zone, you can still wrap them in plastic and keep outside at room temperature. Just make sure the plastic is airtight. This should preserve the brush or roller for the rest of the day. You might even be able to push it to the following day if the wrap is very tight. Latex gloves are great for keeping your hands clean (especially if you're using oil-based paint!). If you can't stand latex gloves or are allergic, a thick application of hand lotion before painting will make cleaning a lot easier later on. Cheap roller covers leave fuzz on the wall. Cheap brushes leave streaky brush marks. Avoid those multi-packs of rollers, ten for a dollar. Pay the extra few cents and get better tools. In the end, your will have a better finished surface. Will the existing painted surface take new paint? And hold it for years to come? Test this out by adhering a strip of duct tape to the existing painted surface and...ripping it away. 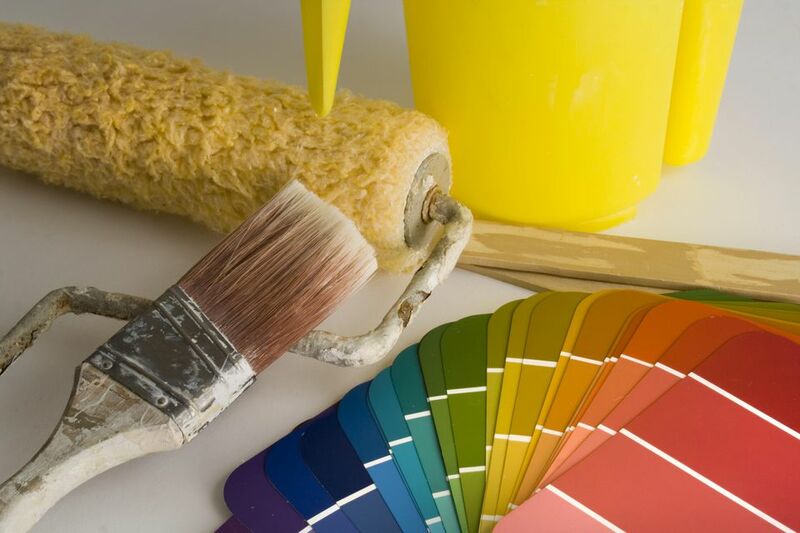 If flakes of paint more than microscopic size come off, you may need to scrape and sand. Also known as "blue tape," this tape comes off easier and doesn't peel off primer or existing paint. Blue tape, by itself, will save you at least an hour of frustration over the old-style beige masking tape. Paint can openers, those little metal keys, are notorious for getting lost in the shuffle. Chain it to a small chunk of wood just like a public bathroom key. Whatever you do, just don't lose it! Follow Painting Process To Make Job Cleaner.